The Small Wars Journal has a tradition of publishing white papers and opinion pieces on the relationship of counterinsurgency tactics to community policing, even advocating the use of regular U.S. military forces to couple with police in the States, and the latest is entitled Counterinsurgency and Community Policing: More Alike than Meets the Eye. I won’t duplicate what ends up being a very long article here, since you can study it yourself. But I will make several observations. The first has to do with his MOS. By training and trade the author is a LEO who apparently deployed as a Naval Reserve Intelligence Officer. He wasn’t the pointy end of the spear as was my son and many others. What you don’t get is the perspective of someone who had to engage in room clearing operations against people shouting Allahu Akbar, chopped boats and people to pieces with an M2 aboard a helicopter, who were boating across the Euphrates River after you had locked down Fallujah, or who constructed your FOB on your back handing sandbags over your head to the next Marine while you were being shot at. I’m not recounting this brief history for fun – it wasn’t for my son. I am mentioning it in order to explain what you do mainly get with this paper: happy face COIN, or the mythical story told to the masses in order to get them to support state-building across the pond. The term counterinsurgency has long been associated with military operations and soldiers. It conjures visions of violent urban combat action, population relocation, social engineering, and a tool for dealing with foreign political emergencies. These visions are not inaccurate as they represent some of the methods and strategies used in COIN operations throughout history. But these methods and strategies do not encapsulate all aspects of COIN. As COIN operations shift from combat to peace keeping and community-building they begin to resemble traditional community policing activities in which the public servant controls through education and raising ethical stature in communities. It is in the transitional phase – when the soldier transitions into the policeman and community facilitator – that COIN and Community policing share the same strategies and tactics. COIN is typically employed by uniformed soldiers, armed with assault rifles and supported by light and heavy armored vehicles and tactical air assets. Community Policing is conducted by uniformed police officers, representatives of the community they serve, with a badge, a holstered pistol, and a number of less-lethal tools. In COIN, soldiers control population movement and space through use of roadblocks, cordoning off, house to house search and clearing operations, and patrolling villages and neighborhoods in HUMVEE’s and Armored Personnel Carriers. In Community Policing, police patrol neighborhoods in police cars, bicycles, foot beats, and horses, people are free to move about and there is no outward show of force. He is intentionally ignoring the militarization of police in America, or perhaps better yet, he is attempting to show both the militarized presence and the so-called population-centric community building he believes police do. In addition to the non-kinetic imperatives mentioned above, similarities can also be found in traditional policing activities such as crime prevention, traffic control, crime investigation, and overall public safety. In COIN operations powers of arrest are generally left to the police organizations of the host nation. However, soldiers stand side by side with their host nation counterpart and provide assistance in the form of identifying and, when necessary, arresting insurgents. Ultimately, the desired end state is a strategy that is seen as legitimate, employing social, political, economic, and security measures that meet the population’s needs, including adequate mechanisms to address the grievances that may have fueled support of the insurgency. In his world, police become social planners, and employ various tools to meet the population’s needs and address grievances, while at the same time coupling with a more militarized presence to tamp down violence and insurgency. This thinking isn’t foreign to American police. They have been playing social planner and policy-maker for decades now, making better sense of the recent blame the Chicago chief of police laid with the availability of guns for violence in Chicago. But heretofore, this thinking i.e., alignment of military with local police, was indeed foreign to military strategists. With papers like this it is becoming more commonplace and when something becomes commonplace and worthy of consideration, it becomes easier to engage. Take note of these things. Not only are the police becoming more militarized, the armed forces is studying policy-making, trying to learn to employ the tools of social engineering and building human terrain systems, and talking about addressing grievances and meeting community needs. It all continues a rich tradition of flirtation with treasonous theories at the SWJ. After all, it worked so well in Iraq and Afghanistan, why not try it in the United States? Major Cliff Gilmore, USMC, currently in Fundahar working with the Afghan police, sends this anecdotal account of the state of affairs inside the Afghan police. One young Afghan policeman told me several weeks ago that until he attended the newly established police training course he didn’t really understand what a “police officer” is. In his experience police were just local thugs armed with rifles provided by the local tribal leader who set up check points along the road to collect tolls for profit. The concept of police who exist to “protect and serve” appealed strongly to him, helps keep my personal hope alive and builds my confidence that we are making steady progress toward the goal of building a principled police force that is trusted by the community and committed to defending it. With a reputation for thuggery and corruption like this, it’ll be a long time before our counterinsurgency efforts will be able to rely on faithful assistance from the Afghan political or security infrastructure. The Afghan army isn’t much better, and it should be noted that in our recent Analysis of the Battle of Wanat we didn’t mention that the run up to the battle found the Afghan army holding meetings with the local population while deliberately neglecting to include the U.S., and collusion between the local police chief and the Taliban who would eventually attack Vehicle Patrol Base Wanat. Pakistan doesn’t fare much better. Just a few days ago U.S. cargo was interdicted in the Khyber pass by Baitullah Mehsud’s Terik-i-Taliban, and several HMMWVs were taken and driven around with Taliban banners. 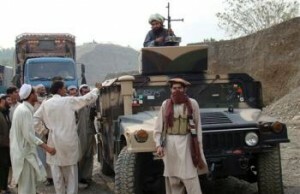 Take careful note of one picture of the Taliban with a HMMWV. No one is on the phone to Police informing them of the Taliban with a stolen U.S. HMMWV. It appears to be quite the party at the roadside of this village. In fact, in the North West Frontier Province as many as 400 police officers have resigned in fear for their lives. “Around 400 cops, including myself, have resigned from our posts as we all still want to live,” Khan, 42, a head constable in Swat police, told IslamOnline.net. Militants of the pro-Taliban Tehrik Nifaz Shariat-e-Muhammadi (TSNM) of Maulvi Fazlullah issued a warning to local policemen last month to resign from their posts. “We don’t want to fight you (local policemen) as you are our own people,” read one of several pamphlets circulated by TSNM militants. The pamphlets advised local policemen to advertise their names in local newspapers if they quit their jobs. Khan, like many colleagues, was initially defiant to cow to the threats but continuing ambushes targeting military and police convoys changed his mind. They published a joint advertisement in a local newspaper informing the Taliban militants that they have quit the police force. A senior police officer of the North Western Frontier Province (NWFP), which borders Afghanistan, confirmed the resignation of around 350 local policemen. “Yes, ads regarding their resignations from the police force are being published in local newspapers in order to save themselves and their families from Taliban,” he told IOL requesting anonymity. Khan, the head constable in Swat police, believed he had no other option but comply to the militants’ demand. “It was my job. I had been earning livelihood for my family, but I realized that there was no other option left for me because of the complete insecurity,” he told IOL. Some 102 policemen have been killed in the past 10 months in militant attacks in Swat and neighboring areas. It’s indications such as this that tell us why General Petraeus said that he was taking on what would be the longest campaign of the “Long War.” Given the importance of working with local police in counterinsurgency, let’s hope and pray that Major Cliff Gilmore and warriors like him are successful with the budding young police candidates who actually wish to make a difference.